Tourists from every corner of the world flock to Thailand for its gorgeous scenery, beautiful temples, ancient ruins, pristine beaches, and renowned hospitality. The “Land of Smiles” is a country of vast contrasts—home to both energetic cities and lush tropical jungles. 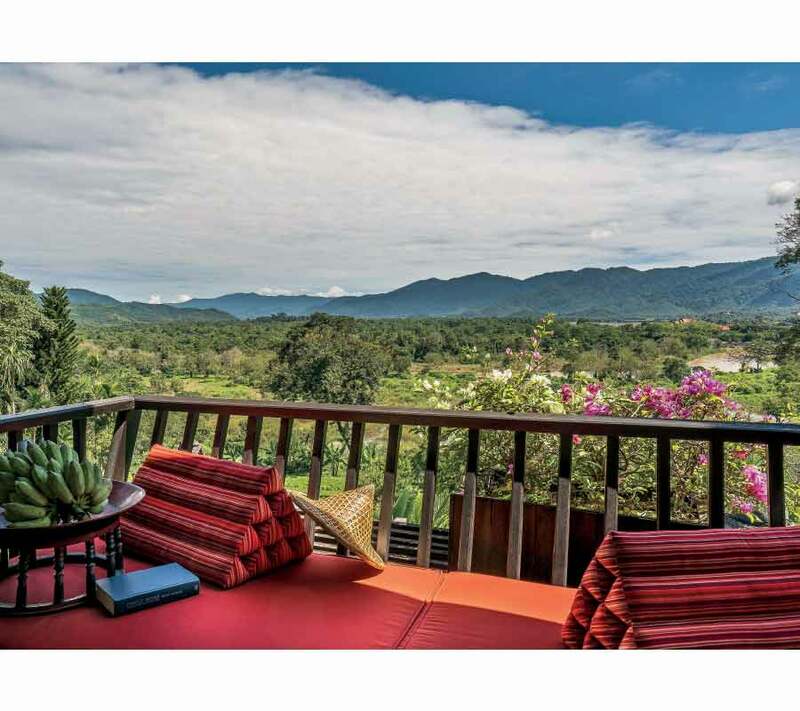 On a recent Thai tour, we savored these contrasts while visiting two very distinct locales—the wild city of Bangkok and the quiet paradise of Chiang Rai. 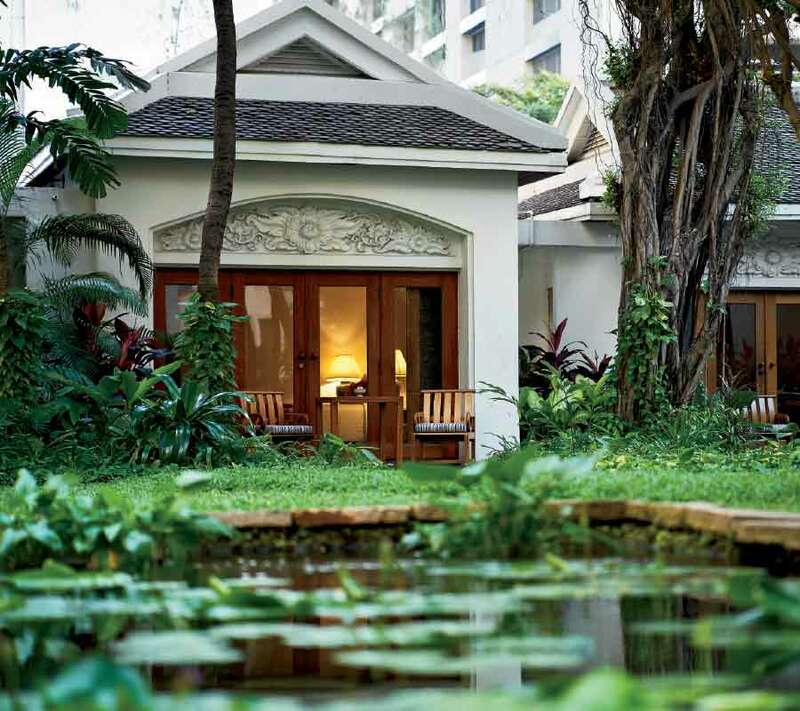 The Anantara Siam-Bangkok Hotel (siam-bangkok.anantara.com) is a luxurious retreat from the bustling city. 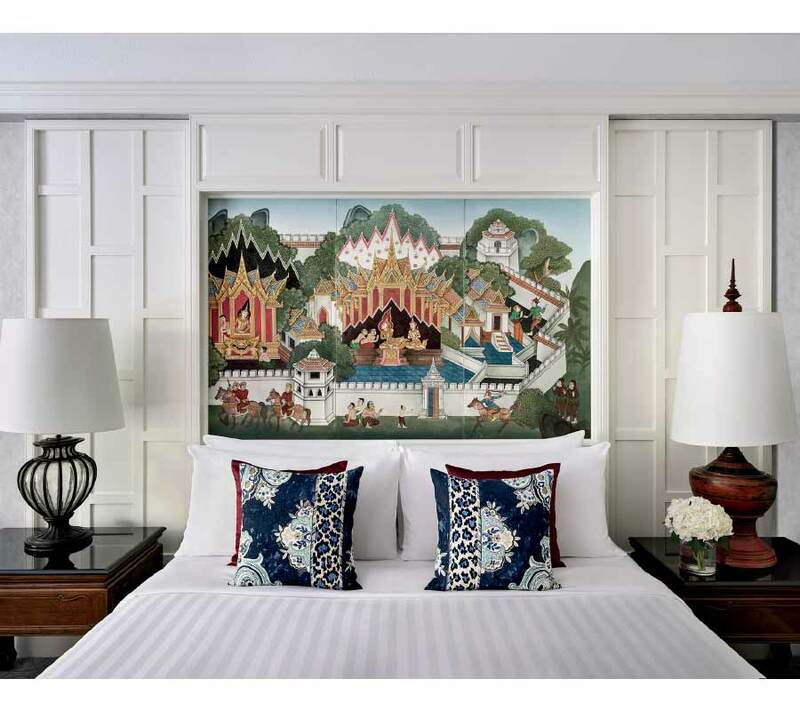 The traditional Thai architecture, hand-painted silk ceilings, and glorious gardens create a serenity that makes it difficult to believe that a city of eight million is just beyond the hotel’s walls. With a location next to the sky train station in the heart of the Ratchaprasong shopping and entertainment district, you are connected with ease to the entire city. The hotel’s dining options offer a choice of award-winning restaurants and the best Sunday brunch in Bangkok. The Spice Market restaurant is designed to resemble an old Thai spice shop and offers a culinary tour of Thailand’s regional specialties. For those afraid of a bit of spice, be sure to alert your server as many of the dishes are much spicier than in the U. S.
If you are in the mood for Italian dining, Biscotti is an excellent choice. This contemporary hot spot presents outstanding handcrafted pizzas, pasta, and seafood dishes paired with wines by the glass. Before exploring the city, start each morning with a hearty breakfast buffet beneath the Bangkok sky in the open-air Parichart Court. Sample everything from classic Thai curries to omelets and pastries while sitting in lush gardens surrounded by koi ponds. One of our favorites was raw honey served on the comb—look for it! Hire a driver and guide for touring the city on your first day. East Meets West (eastmeetswesttravel.com) is a great private touring company. We were thrilled with our gorgeous Mercedes van, white-gloved driver, and English-speaking guide. The half-day jam-packed tour included Golden Buddha—the world’s largest solid gold Buddha; Flower Market—a site that must be seen to really grasp its enormity; Reclining Buddha; and Grand Palace. The Grand Palace was the day’s highlight. Built in 1782, the complex contains the royal residence, throne halls, government offices as well as the beautiful and renowned Temple of the Emerald Buddha. The delicate architecture, pristine grounds, extensive symbolism, and vast amount of gold was astounding. After an exhilarating ride on a long tail boat down the Cho Phraya River, the tour ended with a lovely lunch at a famous Thai eatery in the city’s center. Bangkok’s abundant malls and markets demonstrate shopping’s integral role in Thai culture. The Chatuchak Weekend Market is one of the world’s most famous and largest outdoor markets. For over 70 years, it has welcomed hundreds of thousands of tourists each weekend. Anantara’s spa offers the perfect way to unwind after a day of hectic shopping. Don’t miss the “Siam 2482” signature treatment. Ninety minutes of luxury pay tribute to the healing traditions of South East Asia. Bamboo sticks used to stimulate circulation are followed by warm herbal compresses wrapped in a fabric of healing indigo. Of the many spas we have visited all over the world, my daughter described this as her favorite massage to date—quite an endorsement. After a few exciting days in Bangkok, head for the hills of Chiang Rai and the enchanting world of elephants at Asia’s premier elephant camp. 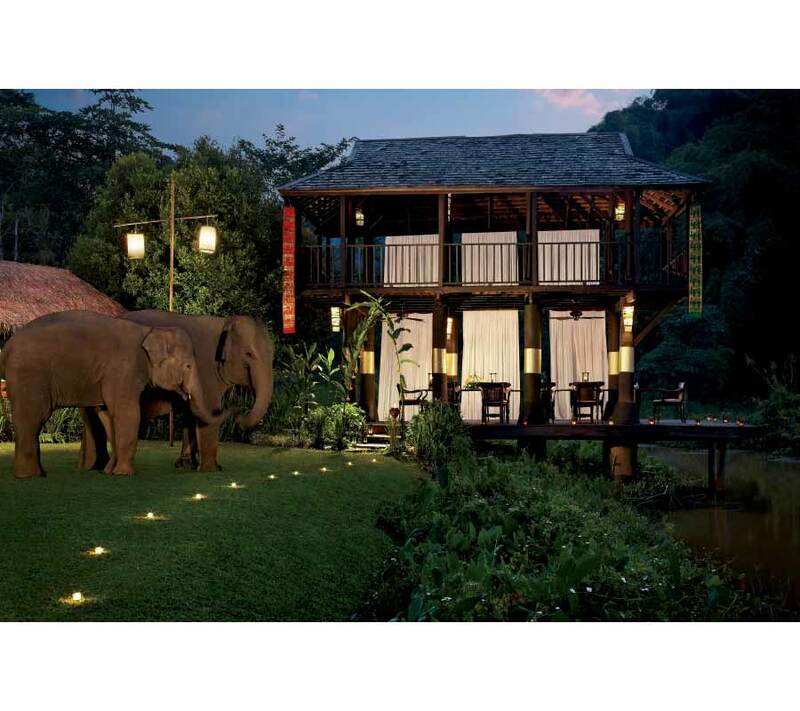 The 160-acre Anantara Golden Triangle Elephant Camp & Resort (goldentriangle.anantara.com) overlooks three countries at the confluence of the Mekong and Ruak rivers—immersing you in the timeless landscapes of the legendary Golden Triangle. Entering the resort is entering a serene paradise. You are greeted by the sounds of trickling fountains and Thai music as soothing aquatic reflections flicker on the entrance hall ceiling. The welcoming warmth of the jungle and the flower-scented air are sure signs that your jungle paradise adventure has begun. 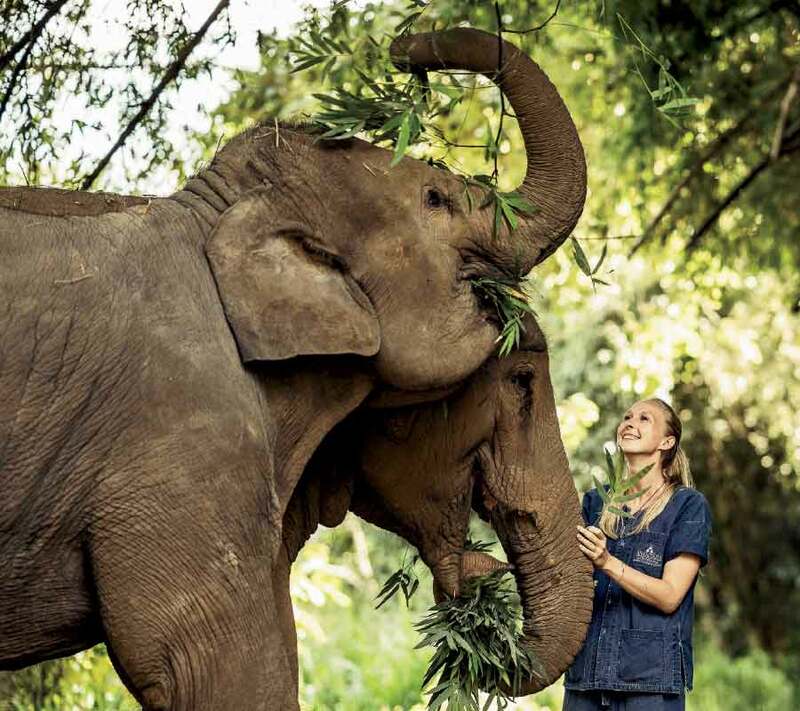 The Elephant Camp works alongside Anantara’s Golden Triangle Asian Elephant Foundation to help Thailand’s elephant population and the elephants’ mahouts (or keepers). After the government outlawed the use of elephants in the logging industry, the mahouts lost their ability to work. Many became homeless using the elephants to beg on city streets. Established in 2003, the camp provides employment, medical care, and a comfortable lifestyle for the elephants and their entire mahout families. A wonderful way to immerse yourself in the Elephant Camp is to purchase the all-inclusive Discovery Package, which includes different experiences ranging from mahout training to bathing elephants to shopping for exotic ingredients. For those seeking an incomparable dining experience, the “Rice Paddy Dinner” is a must add-on to your package. This wonderful introduction to the gentle giants begins with insights from the resident scientific expert about how elephants think and behave, how their bodies are built (elephants wear high heels), what they eat, and how the various species of elephants differ around the world. You will also learn about the mahout lifestyle and the history of Thailand’s elephants. Post-presentation you interact with the elephants by feeding and bathing them! Journey into the jungle with two baby elephants, their mahouts, and the camp veterinarian where you’ll observe the elephants on their daily walk while learning about elephant biology and behavior. Much more than a cooking class, this is an immersion in Thailand’s famous gastronomy. During an early morning shopping excursion to a local market, you’ll see an array of exotic sights including large bugs (used to create a cooking paste), live fish, animal heads, and exotic spices. Back at the resort, after gathering a few final ingredients from the resort’s spice garden, the chef guides you in the preparation of a three-course meal with step-by-step instruction in a the state-of–the-art cooking facility. Once complete, the meal is enjoyed at a long table with wine and conversation. An amazing private dining experience within the Anantara resort comes with a personal chef, personal butler service, and a hand-selected menu. While dining at the beautifully appointed table, you watch the elephants at play. Speaking of dining, the resort boasts two exquisite restaurants: Baan Dhalia offers Italian and Mediterranean cuisine and an extensive wine cellar; Sala Mae Nam serves delicious traditional Northern Thai cuisine. Breakfast at Sala Mae Nam is yet another daily adventure. Intoxicating views are accompanied by delicacies including fresh fruits, traditional Thai dishes, omelets and waffles. Breakfast is enhanced by a darling baby elephant who approaches you each morning hoping for a banana that she peels and eats. Between jaunts with gentle giants and feasting your eyes (and stomachs), be sure to make time for the Anantara Spa. The spa’s Thai wellness practices and exotic elixirs are enjoyed in a luxury suite with an inspirational view of three countries. For the travelers craving both bright city lights and unforgettable encounters with nature, the above itinerary to Thailand offers it all!